This weekend, my precious Emma joined Holland and his friends and biked around Lake Padden to raise money for the people of Haiti. There was a good turn out, several families joined in. You can see our crew on the far left of this photo. I think there were a total of eight kids on bikes raising money, and of course, the families came along, too. I had the twins in the double stroller and Drew in the front-pack while Marty went along side Emma and helped her along. 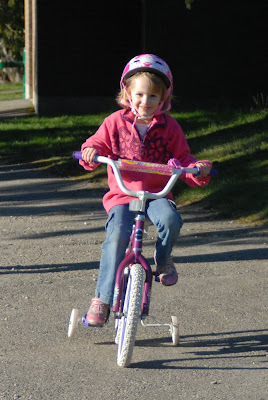 She is not the best at biking (since we live on a gravel driveway and a road that no parent in their right mind would ever let their child ride a bike near) so the hilly trail was something that she needed assistance on from time to time. I stopped partway around to get this shot, it was beautiful. It's amazing to think that we all went around the entire lake, and my five year old just kept going. She never said she wanted to stop, or that she was tired, or anything. She was such a trooper, we were so proud of her. Here she is approaching the finish line. My amazing girl, making a difference in the world. I am proud to say that Emma raised $175, and the whole Holland bikes for Haiti event brought in over $1,700. Way to go, kids! This is amazing as it was an event that was thought up by a four-year-old. How far can $1,700 go in Haiti? I cannot even imagine. Emma was thrilled at the amount she was able to earn. She asked me, "Mommy? Do you think it's enough to build a roof?" I don't know, baby, but I bet it's close. If you ever feel that you can't make a difference in the world, think again. This just proves that anyone can so anything, if you just put your mind to it. Great job, Emma! We are so proud of you! Way to go Emma. We are very proud of you! Way to go Emma!!! And the rest of the kids. I cried when I read Emma's question about building a roof! So sweet! And the funny thing is, you never know when something like this could be with Emma forever, and when she grows up, she will still be doing things like this, who knows? In every sense, Emma, you GO, girl! That's fanatastic! And I just have to say -- that shot of the lake? That's the lake are you joking? 2) It's BEAUTIFUL, things like that are only meant to exist in storybooks and perhaps New Zealand. It's BEAUTIFUL!! !